Beauregard - Louisiana Agricultural Experiment Station release. Rose skin color, orange flesh and stores well. Produces more # 1 roots than Jewel. Resistance to white grub and soil rot (pox). Susceptible to wireworms and rootknot nematode. Early maturing (100 days). Bradshaw - Selected by Dr. David Bradshaw, this is his personal favorite. A vigorous grower and very productive. The rose-colored skin covers rich orange flesh. There may be slight variability in the flesh color, but the flesh is always richly sweet and creamy with very few strings. Many growers have reported white tail deer select other sweet potato varieties to browse, leaving the Bradshaw potatoes with little damage. Dr. Bradshaw says “This is the best sweet potato I've ever eaten!” Without a doubt, this is our most popular home garden variety. O'Henry - A white-skinned, cream-fleshed variant of Beauregard. Its maturity, disease resistance, and eating quality is similar to Beauregard, though the flesh is a little drier, but not as dry as some of the old white varieties. 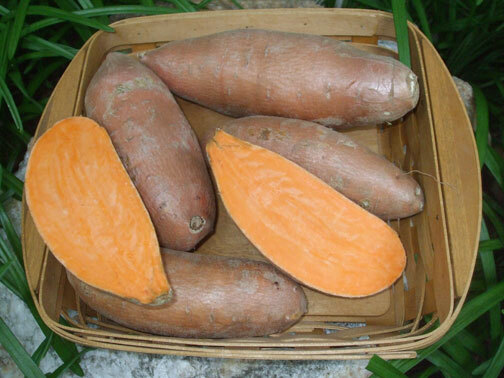 We are pleased to offer 3 different types of Sweet Potato varieties - Beauregard, Bradshaw, and O'Henry. Please click the orange "Sweet Potato" link above for details on each variety. NOTE: To order 2 dozen sweet potato plants (for example) enter a quantity of 2. Then at the bottom of the first checkout window list the number of dozens of each variety such as: 1 dozen O'Henry, 1 dozen Beauregard. of dozens or varieties ordered. Plants will be shipped mid-May to early June. Sorry, we cannot ship to California, Arizona, or Hawaii.